Iranian cuisine is as diverse and different as its many regions. The food is so tempting, exotic and enticing that if you happen to pass through one of the winding alleys of any Iranian city or village about noontime, the wonderful scents coming from the windows of the houses will make your mouth water. Explore the sights and tastes of the ancient and beautiful cities of Iran. After your arrival in Shiraz, you will be met at the airport and taken to your hotel to check in and relax. Overnight stay in Shiraz. After a traditional Iranian breakfast, you will tour some of the historic and cultural attractions of one of the oldest cities of ancient Persia. See the impressive Zandieh Complex that includes The Citadel of Karim Khan, Pars Museum, Vakil Bath, Vakil Mosque, Moshir Caravanserai and Vakil Bazaar, the traditional bazaar of Shiraz. You will also visit the Jahan Nama Garden, the oldest garden in Shiraz and the tombs of Hafez and Saadi. It is a moving experience to visit these beautiful gardens, joining other visitors reading poems over the graves of two of Iran’s most famous poets. Then continue your tour with a stop at the Quran Gate and either the Ali ebne Hamze or Shah-e-cheragh shrine. You will be stunned by the beautiful play of light in the shrine. The entire interior is covered in tiny, glittery mirrors and it will leave you breathless. Overnight stay in Shiraz. Shiraz is known as the “city of flowers and nightingales.” Today you will visit one of the most famous gardens in Shiraz, the Eram Garden, a UNESCO World Heritage Site. You will also visit one of the oldest mosques in Iran, the 9th century Jame Atiq Mosque and the famous Nasir ol-Molk . Mosque which bathes visitors in a kaleidoscope of colors. Also on the morning schedule, is a stop at two elegant traditional homes the Narenjestan Palace and Zinat-al-Molk House. 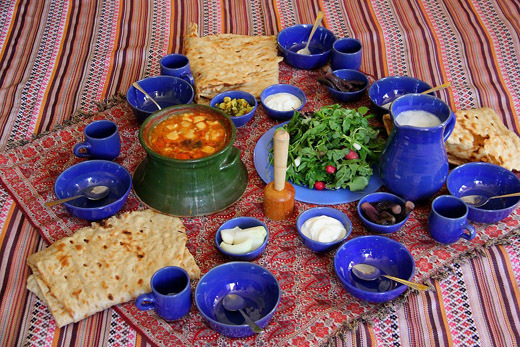 In the afternoon, after lunch, you will learn more about Persian cuisine in a cooking class. Overnight stay in Shiraz. A short distance from Shiraz is some of the most important sites of the ancient Persian Empire. Spend the day exploring the ruined palaces of Persepolis, the imposing tombs of Naghsh-e-Rustam and the remnants of Cyrus the Great’s capital, Pasargadae. Then you will drive into the heart of the Zagros Mountains to the village of Bavanat where you will learn about the daily life and traditions of nomadic people. In Bavanat, you will have a Persian cooking class taught by one of the best Iranian cooks. The overnight stay in Bavanat is an outside camping experience with the nomads and you will have a delicious dinner prepared by a local cook Overnight stay in Bavanat. In the morning, after breakfast, you will take a walk through the mountains to see springs and a walnut forest. Learn more about local customs and traditions during your visit to several small villages that are hidden in this green, lush landscape. You will have a home stay in a traditional home in Bazm Village. Overnight stay in Bavanat. Leaving Bavanat, you will travel to the heart of Iran, Yazd. On the way you will have a stop to see desert landscapes. After arriving at Yazd, you will check into your hotel and then have time to relax and explore some of the alleys of this ancient city. Overnight stay in Yazd. A full day will be spent discovering one of the oldest cities on Earth. You will visit the Zoroastrian Towers of Silence and Atashkadeh Fire Temple. In the afternoon, visit the famous Jame Mosque with its twin minarets that tower over the surrounding city and the Amir-Chakhmaq Mosque, a beautifully symmetrical three story Hosseinieh. You will also visit the nearby Water Museum, housed in a restored old traditional house. An afternoon cooking class in Persian cuisine follows. Overnight stay in Yazd. Along the way to Isfahan, you will stop in the desert town of Nain . to visit the Jame Mosque, one of the earliest mosques built in Iran. Built in the 8th century, the mosque is still in use and features wonderful brick work and a minaret that towers over the city. You will also see the Ethnology Museum at Pirnia, a restored old traditional house and, if there is time, the Rigareh Water Mill and Aba Bafi man made caves. Overnight stay in Isfahan. After breakfast, begin your tour of Isfahan, a city so renowned for its beauty that is was called “Half of the World.” There are a number of UNESCO World Heritage Sites here and a wide range of Islamic architectural styles represented in this memorable city. Chehel Sotoun, the palace of forty columns, is a Safavid era pavilion with beautiful murals and a pretty garden is the first stop. Not far from Chehel Sotoun is one of the biggest squares in the world, Naghsh-e-Jahan Square. The square is surrounded by two beautiful mosques, the Imam & Lotfollah Mosques, Ali Qapu Palace and the Qeysarie Bazaar. You could spend hours wandering through this old bazaar visiting the many artisan shops with traditional handmade crafts for sale. After a Persian cuisine cooking class in the afternoon, you will walk along the Zayand- e- rood River and visit Isfahan’s famous ancient bridges, the Si-o-se pol and Khadju Bridge. Overnight stay in Isfahan. Another day is required to see more of Isfahan’s glorious sites. You will visit the magnificent Jame Atiq Mosque, a UNESCO World Heritage Site and one of the oldest mosques in Iran as well as the Ali Gholi Agha Bath. You may also visit a place that is one of the most remarkable examples of eccentricity in Persian architecture, the Safavid era Pigeon Towers. In the afternoon, you will visit Hasht-Behesht, a Safavid palace called Eight Paradises and Vank Cathedral. Located in the old Armenian quarter, this church is elaborately painted with Biblical scenes. Finishing your tour of Isfahan, you have a short drive in the afternoon to the beautiful old traditional village of Abyaneh. Rising up the side of Karkas Mountain, Abyaneh’s twisting lanes offer many splendid views. Overnight stay in Abyaneh. You will spend a full day touring Tehran, the capital of Iran. Visit historic Golestan Palace, a Qajar era palace that combines Persian architecture with Western decorative influences. A UNESCO World Heritage Site, this lavish complex of 17 palaces and gardens is both a historic site and museum. You will also visit The National Archaeological Museum, a showcase for Iran’s rich and ancient history, as well as the Glass Museum and Carpet Museum. After your taste of Tehran, you will be taken to Imam Khomeini International Airport for your flight home. After breakfast, you will have an early morning drive to Kashan, a beautiful oasis city on the edge of the Dasht-e Kavir. Here you will see the Borujerdi and Tabatabei Houses, gorgeous 18th and 19th century traditional homes built by wealthy merchants. You will also visit the Agha Bozorg Mosque, which has a beautiful garden in its sunken courtyard and the Fin Garden, another UNESCO World Heritage Site. Built in the 16th century, the beautiful and serene the Fin Garden is the oldest living garden in Iran. Leaving Kashan, you will have a short drive to Tehran. Overnight stay in Tehran.